The dialogue surrounding graffiti in Limerick has reached a new low. In at least five major stories in just over a week, the Limerick Leader has hyped the "problem" of graffiti in the city. This paper has called this activity a "scourge", "blight", and "epidemic", a "shocking" and "disgusting" act. Apparently the writers are not well versed in journalism, since their language is far from impartial. They write of two people arrested for graffiti as though they were already accused of their crime, a mistake that would have them kicked off a paper that had any ethics at all. But the low standard of Limerick newspapers -- in terms of spelling, grammar, basic intelligibility, and ethics -- is plain to see and not really even that interesting. So let me move on. The interests of the land-owners and commercial elite is obvious in this matter. Many times in the articles I surveyed, the properties were said to be "destroyed" by graffiti. This despite the rather obvious fact that paint does not cause structural damage and so cannot possibly be regarded as "destroying" a building, or any other physical structure for that matter. Perhaps instead what it destroys is a certain balance of power that sees (not just) the young as alien and a threat to society at large. Limerick has the highest unemployment rate in the country. While the national average was 14.8% as of June 2012, in Limerick it was 28.6%. Of the ten worst employment "blackspots" in the country, fully seven are in Limerick. And the situation is worse for the young, with more than half being out of work in Limerick. Let me repeat that: over fifty percent of young people have no jobs now and would be forgiven for thinking they have no future either. Let us not forget that Ireland is a country that has sold itself to the bankers and mortgaged its future for at least the next few generations. Each and every citizen is now paying off a debt we did not incur, in one of the biggest scams a state has ever put over on its people. But despite the actions of our "leaders", it is instead graffiti that is "soul destroying". To people who make this claim I ask: which is worse for the soul, a tag painted on the outside of a building? 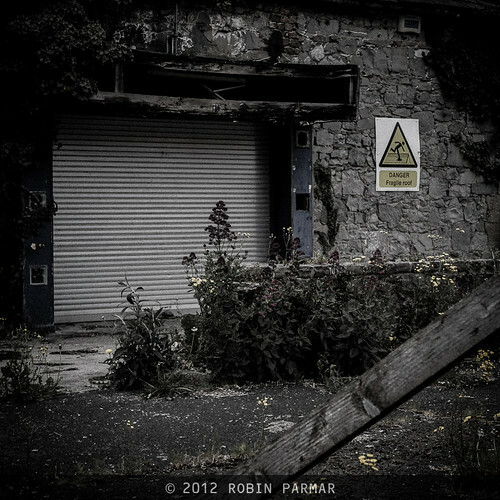 Or that same building lying closed and abandoned for many years? All around Limerick (and not just here) store-fronts are allowed to crumble, sites become structurally unsafe, metal rusts, old petrol stations leak contaminants into the soil. Ugly fences surround uglier properties, without even the most basic clean-up performed. 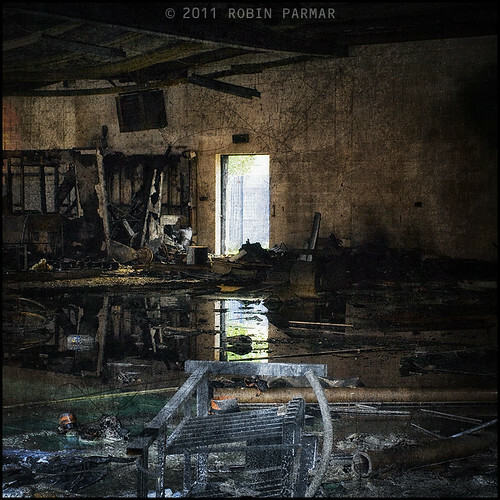 One example: near where I live an abandoned carpet factory lay in ruins for years until it was torched (photo above). And then that burnt-out husk was allowed to stay as it was for many months, until finally (only just recently) it was cleared. The only conclusion to be drawn is that it is perfectly acceptable for a business person to milk a site for as much money as they can, and then simply walk away, leaving the ruins of their financial obsession as a monument to others. 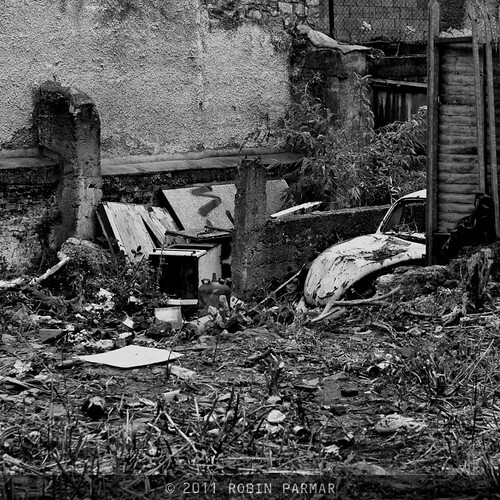 As a photographer I have documented the urban situation in and around my home. I have witnessed street drinking, drugs, and violence. Fires have raged right outside my home and fire departments have not responded in a timely fashion. I have even had the grave misfortune of watching someone kill themselves in public. The police took more than fiften minutes to arrive... with the nearest garda station one minute away. Compared to this, is tagging the "scourge" of society, a "blight" on our city, an "epidemic"? Or are there not deeper issues to consider? In my next article I will point to some solutions.